BRYAN EATON/Staff photo. Margery Jennings picks nasturtium and marigolds in her plot at the Amesbury Community Gardent at Battis Farm on Monday afternoon. 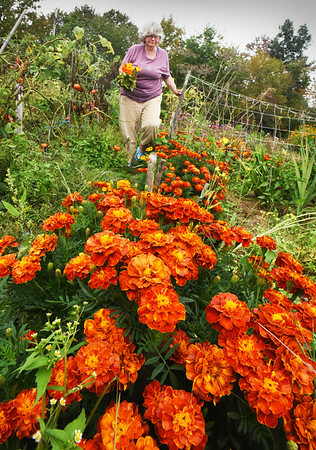 In addition to the plethora of flowers, the Amesbury resident, who has had a plot there for 15 years also grows a range of vegetables from parsnips to lettuce and carrots.